Bed and breakfast accommodation, B&B - Cross Farm, Ellastone, England. 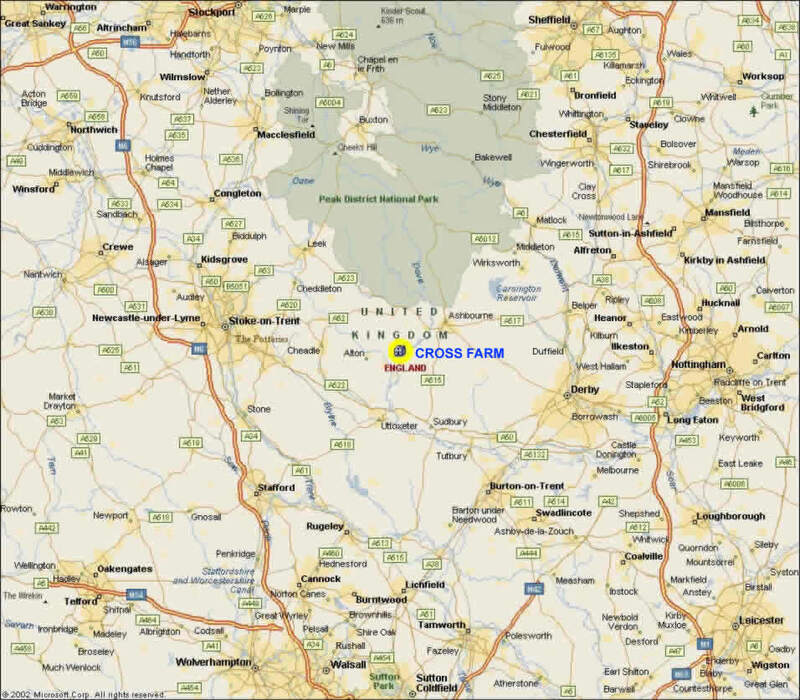 Cross farm accommodation is situated between 4 Market towns in the East Midlands and West Midlands - Ashbourne, Leek, Cheadle and Uttoxeter; with easy access via the M1, M6, A50, A38 and A52. East Midlands Airport (Ryan Air, Easy Jet, Fly Be, BMI, etc) is just 50 minutes drive away. Other Airports are Manchester, Birmingham and Liverpool which are approx 1hour 30 minutes. At all airports we use and recommend Europe Car. If traveling by train there are stations at Uttoxeter (6 miles), Stoke on Trent (10 Miles), Stafford (20 Miles), Derby (24 miles), Burton on Trent (25 Miles). Ideal for Alton Towers accommodation, Daisy’s Cottage is also near to Splash Landings, Waterworld, Indoor Snow Dome, Heights of Abraham Theme Park, The Monkey Par and, Chester Zoo. For the more active there as Dovedale, the Peak District, Blithfield Water and Carsington Water with water sports. We are close to many Trails ideal for walking, cycling and horse riding at Denstone, Alton, Dimmingsdale, Ashbourne, Cauldon, Cheddleton and Middleton. Cycle hire is available from: Ashbourne, Waterhouses, Buxton, Carsington and Middleton by Wirksworth. Cross farm accommodation is situated between 4 Market towns in the East Midlands and West Midlands - Ashbourne, Leek, Cheadle and Uttoxeter; with easy access via the M1, M6, A50, A38 and A52. East Midlands Airport (Ryan Air, Easy Jet, Fly Be, BMI, etc) is just 50 minutes drive away. Other Airports are Manchester, Birmingham and Liverpool which are approx 1hour 30 minutes. At all airports we use and recommend Europe Car. If traveling by train there are stations at Uttoxeter (6 miles), Stoke on Trent (10 Miles), Stafford (20 Miles), Derby (24 miles), Burton on Trent (25 Miles). Ideal for Alton Towers accommodation. We can be contacted by phone, fax or e mail and we are delighted to answer any queries. We are extremely friendly and offer a warm welcome for all. Please click here to download an Adobe Acrobat PDF of the maps (97KB file size) or Motorway directions (69KB file size). 6. Turn LEFT into Cross Farm B&B (after B5033 Dove Street). 2. At roundabout take the first exit onto B5030 4.8 miles. 3. Continue past the JCB headquarters (Rocester). 4. Bear right at roundabout onto B5032 (north). 5. As you enter Ellastone, turn right into Cross Farm entrance.